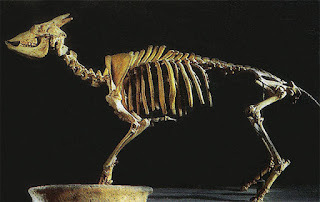 Remains of the Balearic Islands Cave Goat (Myotragus balearicus) have been found on the islands of Majorca and Menorca. This clear example of island dwarfism went extinct some 5,000 years ago. While it still bears the name 'goat', genetic analysis has revealed that it was more akin to sheep than to goats. The Balearic Islands Cave Goat was standing about 50 centimetres high at the shoulder and weighed between 50 and 70 kilograms. It had rather short legs, which meant that the Balearic Islands Cave Goat could not have run very fast. They had no need to do so, because on these isolated islands no predators except for some birds of prey, from which they probably hid in the vegetation. The Balearic Islands Cave Goatwas able to grow at flexible rates, halting the growth process when food was unavailable. 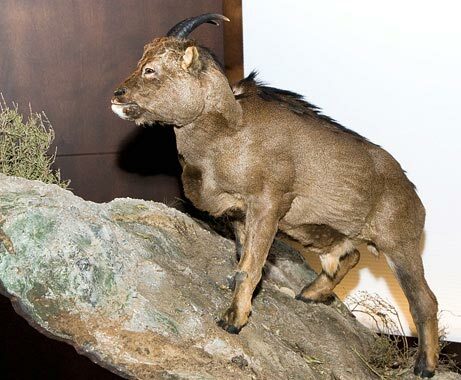 This species was probably the only mammal ever to adapt in this way, and it probably helped the goat survive for five million years before - as some scientists believe - being driven into extinction by human hunters. Another unsusual feature of the Balearic Islands Cave Goat was that it had eyes that were directed towards the front like nearly all primates and carnivorans. It gave the species stereoscopic vision. Before human colonisation, the Balearic Islands were once covered by forests. In this habitat, the Balearic Islands Cave Goats would probably move about in solitude or in small groups. At first, the Balearic Islands Cave Goat only colonized the island of Majorca. On nearby Ibiza a strange ecosystem without terrestrial mammals developed in which birds and bats were the main vertebrates, while in Menorca a giant rabbit, the Minorcan giant lagomorph (Nuralagus rex) evolved that covered the same niche as the Balearic Islands Cave Goat on Majorca. 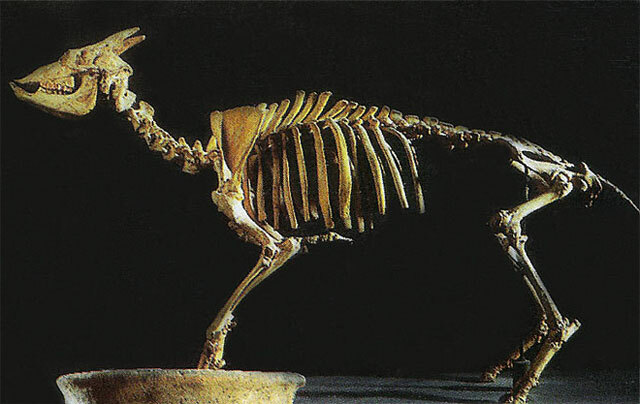 With sea levels falling during the last ice age, Majorca and Menorca were united and the Balearic Islands Cave Goat replaced the great Menorcan lagomorphs. Both islands separated again at the beginning of the Holocene. Lalueza-Fox et al: Molecular dating of caprines using ancient DNA sequences of Myotragus balearicus, an extinct endemic Balearic mammal in BMC Evolutionary Biology - 2005. See here. Quintana et al: Nuralagus rex, gen. et sp. nov., an endemic insular giant rabbit from the Neogene of Minorca (Balearic Islands, Spain) in Journal of Vertebrate Paleontology - 2010. See here.